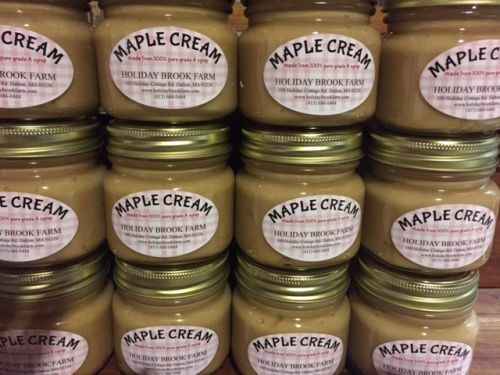 There is nothing more delicious than Maple Cream! Maple Cream is made by boiling finished maple syrup to 24-26 degrees above the boiling temperature of water, then cooling it down to about room temperature and then stirring...and stirring...and stirring until it begins to get cloudy, then you stir some more, and you keep stirring until the cream is smooth and light in color, at which point it is ready for bottling. After making our maple cream by hand for many batches and some very sore arms, we decided to purchase a maple cream machine which does the hard work for us! We can now make many cases of this decadent product at one time and we sell it at our farm store as well as some local markets.